The odds of winning the lottery are absolutely ridiculous, Smart Play Lotto Wheels will improve your chances to win the lottery. If you play a 6/49 lottery game for example, the chance of winning the jackpot is about 1 in 14 Million. This is roughly the same probability as flipping a coin and getting heads 23 times in a row. So forget the Jackpot and set your sights on small to medium sized wins. This is where Smart Play Lotto Wheels do their work. Playing a single ticket without a lottery wheel yields about a 1 in 55 chance to win a 3 number prize, 1 in 1000 chance to win a 4 number prize and a significantly lower, 1 in 55 000 chance of winning a 5 number prize. With Smart Play Lotto Wheels, these huge denominators are diminished and your odds to win DRAMATICALLY INCREASE! Players who purchase quick pick tickets are at a huge disadvantage in winning the lottery. It’s a shot in the dark to win with a quick pick and the lottery foundations know this. With a smart, effective lottery wheel, you increase your odds to win substantially. Our lottery wheels work exceptionally well and have been Tested and Proven. Our wheels very easy to use and understand without compromising mathematical effectiveness! The BIG difference between our wheels and the competition is that every Budget, Conservative and Max play wheel you get, has actually WON MONEY..
It’s a common misconception that when using a lottery wheel, there is a serious commitment level. Unlike a lottery system, a lottery wheel can be used any time you want. Although some lotto wheels can make playing the lottery expensive and you’ll have to budget carefully. This is where Smart Play comes in. We specialize in Pick 6 & Pick 5 Lottery Games and our wheels are Tested and Proven to win you money. The most effective lottery wheel doesn’t have to be the most complicated one, nor does it have to cover hundreds of combinations (costing you big money). Smart Play Lotto Wheels are exactly that, SMART. They save you money on every lottery draw while still giving you incredible odds to win. Although No lottery wheel can ever guarantee you’ll win the jackpot, we can assure you’ll see much better results. 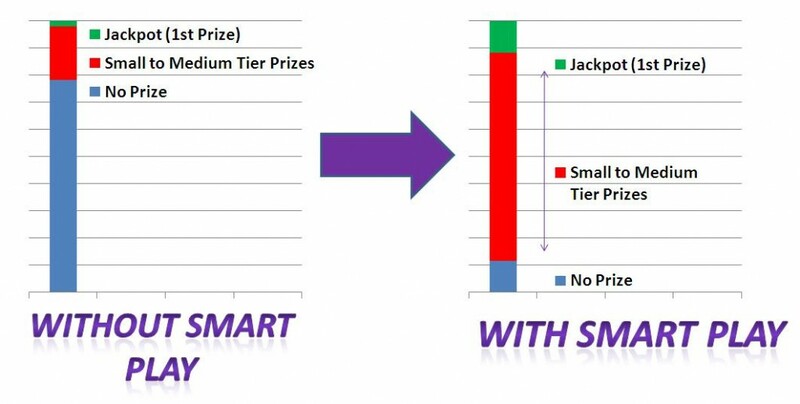 While our Smart Play Lotto Wheels do certainly increase your odds to win the top prize, their specialty is their uncanny ability to expand your winning zone. We have a no refund policy as no lottery system can guarantee wins, only increase your chances to win.